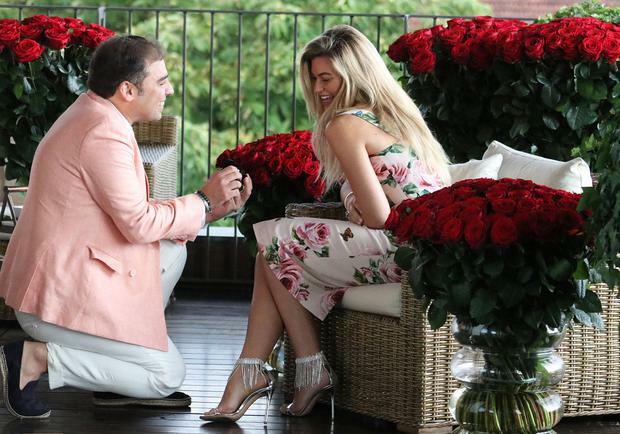 Sports Illustrated star Samantha Hoopes is officially engaged, after her boyfriend popped the question in a room filled with 380 red roses. The swimsuit model said 'yes' to boyfriend of just over one year, entrepreneur Salvatore Palella in Italy this week, and the couple have been enjoying every second of their engagement celebrations since. The couple met in the picturesque village of Portofino on the Italian Riviera in June 2017, hitting it off immediately. They marked their one year anniversary with a trip back to the place they first met and it was there - in the luxury surroundings of the Bulgari Hote Milano - where Salvatore got down on one knee to ask Samantha to be his wife. "380 days we have looked at each other in the eyes and then (380 days and then 381 bc of time zones).. this morning on the airplane back to where we first met where you presented 381 roses from now until forever we will be together and today we promised to be forever together!" the bride-to-be wrote on Instagram. "You’re mine @palella and I’m beyond with our love I can’t wait to spend forever plus 381 with you baby." The couple shared snaps from the proposal taken by a hired pro photographer, who captured groom-to-be Salvatore down on one knee on a balcony filled with 380 red roses. Model Samatha shared a snap of her new engagement ring with her 1 million Instagram followers, who were quick to congratulate the couple on their happy news. "When we met a year ago I couldn’t have foreseen the immense happiness you would bring to my life. Every day with you is a celebration and I couldn’t think of a better person I would rather share my life with," Samantha said. "Not only are you so handsome but your mind is something I will explore forever." The couple later sailed to Porto Cervo in northern Sardinia after a trip to Florence and the Gucci Garden. "You know life has many ups and many downs but all that matters in the end is who you spend your time with bc it’s something you will never get back," the model captioned a photo of herself after a dip in the turquoise ocean on the Costa Smeralda, "that’s why you always have to live your best life."